French security officials have long regarded the Algerian jihadist movement al-Qaeda in Islamic Maghreb (AQIM) as the most immediate terrorism threat to Europe. Those fears appeared to have been substantiated last week with the arrest of a French physicist who is suspected of plotting terrorist attacks in Europe on AQIM's behalf. However, in an indication of the many options now open to aspiring radicals who want to put their extremism into action, investigators say the scientist linked up with AQIM only after police cracked down on another terrorist group he had been in contact with first. Revelations in the case have slowly emerged following the Oct. 8 arrest of 32-year-old French-Algerian Adlène Hicheur, who holds a doctorate in particle physics. Hicheur was nabbed after intelligence officials intercepted encoded e-mails he sent to AQIM members offering to plan terrorist strikes in France. 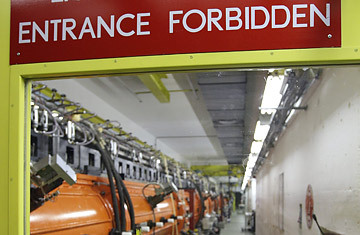 Reports in the French and British media initially focused on Hicheur's scientific work at the European Organization for Nuclear Research (CERN), which has a gigantic particle collider straddling the France-Switzerland border. Many reports suggested that Hicheur had either planned an attack on the installation or had sought to pass information or material to AQIM so that jihadis could construct a nuclear weapon. Neither was true: CERN says it has nothing on its property that could be used to build a nuclear bomb, and Hicheur's limited security access didn't allow him close enough to the main collider to launch an attack on it. "The fact that he was employed by CERN is not particularly significant compared to the more general fact he's an extremely well-educated scientist whose knowledge would have been useful to anyone planning terror strikes," a French counterterrorism official told TIME on condition of anonymity. "We've had several cases of highly educated, disciplined and focused people turning up in terror cases where you'd least expect them, but this is by far the boldest example of someone with so much training and talent reaching out to extremists and saying, 'Use me.' "
There is conflicting information on just how far Hicheur's plans had progressed. The London Daily Mail reported on Tuesday that Hicheur had targeted an oil refinery owned by the French company Total and wanted to create an explosion capable of destroying a "city the size of London," according to unidentified sources. The French official would not comment on the Daily Mail report but did say that Hicheur "had some written projects and drawings concerning certain targets in France." The official added, however, that Hicheur "had not gotten close to defining a plot." The official said that Hicheur's name first arose in earlier Franco-Belgian investigations into a network that is suspected of finding recruits in the two countries and sending them to the Afghanistan-Pakistan border area to undergo training to eventually launch attacks in Europe. Among the group's members was Malika el Aroud, the widow of an al-Qaeda suicide bomber who killed the anti-Taliban militia leader Ahmed Shah Massoud in northern Afghanistan two days before the Sept. 11 attacks. El Aroud, a Belgian national, wrote a radical blog and participated in online forums urging Muslims to join the jihad against the West. The network was broken up last December when Belgian police rounded up 14 suspected members ahead of what authorities feared was a planned suicide bombing of a Brussels meeting of European Union leaders. Then, in May, two French extremists from the group were arrested entering Italy with five Palestinian and Syrian aliens whom French authorities said were to be used as suicide bombers in European strikes. It's unclear exactly when Hicheur began communicating with el Aroud's group or whether he was interested in going to Afghanistan or just looking for other terrorist-group contacts. Either way, the busts in December and May left el Aroud's group weakened, apparently causing Hicheur to seek out other extremists in online forums. "[Hicheur] eventually found AQIM people ready to discuss and encourage his jihadist ambition," the French official said. "These forums allow extremists from different countries to strike up partnerships and even plan together ... But that gives police and intelligence services very useful places to keep under close watch." With the Taliban now resurgent in both Afghanistan and Pakistan, el Aroud's group has managed to remain active despite the raids that have sapped its membership. Hicheur's ability to move from that group directly into AQIM circles, meanwhile, is a reminder of how many places the terrorism threat now resides in Europe. Hicheur's case also marks the first instance of AQIM using a French recruit as an active terrorist operative in Europe, rather than solely for logistical assistance as the group has in the past. All the more reason for Europe's counterterrorism authorities to continue their online vigil  and check out even the seemingly least-likely candidates for jihadist activity.